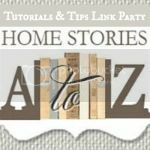 Welcome to the 93rd week of the Tutorials & Tips Link Party! I’m excited to see what projects you have been working on this week. I have a quick “tip” to share with you tonight. I am a proud brand ambassador for Homes.com and they currently have a fun survey with a huge payout for one lucky winner! Whether you’re looking for a home for sale or rent, Homes.com is constantly looking for ways to make the home search process easier. Help them out by completing this brief survey and automatically be entered to win $500! And now let’s get the party started! Please remember that if you’d like to link up, be sure to read the rules before linking. Thanks so much for hosting the link party. I look forward to exploring all the ideas and being inspired! I can ignore laundry all day with these great links! Thank you for hosting! Thanks for hosting, Beth…but, why did you change the linking format? I can see already that I’m not going to have patience clicking, scrolling and viewing individual pages to view links, rather than scrolling on one page. I feel if one is not on the first page we will get overlooked 🙁 Waah! Thanks for hosting — there are so many great crafts and DIY projects here! I could spend hours perusing them all! Slowly getting back in the swing of things – thanks, as always for the party. And this is the wrong thread but those beams in your kitchen (and, in fact your whole kitchen) look amazing. Thanks for hosting another great party, Beth! Thank for hosting, Beth. I love going to sites like homes.com to look around and daydream even though we’re not currently looking for a new home. Thanks for the wonderful party, have a great day & week! Thanx so much for hosting Beth! Thanks so much for the party Beth! Hope you have a wonderful week! Thank so much for the party! Have a great week! Congrats on being an ambassador, and thanks for hosting again! Thanks for hosting, Beth! Always a pleasure to party with you! Thanks for having this blog link party for us to share our posts with each other! thanks for hosting – I am a facebook follower! love your blog! Thanks so much for hosting, Beth! Have a great week! Thanks so much for the party Beth! Thanks so much for hosting ~ it’s always fun to link up! Thank you so much for hosting Beth, have a great week! Congrats on being an ambassador for Homes.com. Thanks for hosting, Beth. Thanks so much for hosting Beth!! !